Why, for centuries, have the West and the world continuously produced China knowledge that deviates from Chinese realities? Why, since the mid-nineteenth century, have Chinese intellectuals oscillated between commendation and condemnation of their own culture, and between fetishization and demonization of all things Western? And why have some of the world’s wisest thinkers expressed opinions on Chinese culture, which are simply wrong? In order to answer these questions, this book explores the process of knowledge production about China and the Chinese civilization and in turn, provides a critique of the ways in which this knowledge is formed. Ming Dong Gu argues that the misperceptions and misinterpretations surrounding China and the Chinese civilisation do not simply come from misinformation, biases, prejudices, or political interference, but follow certain taken-for-granted principles that have evolved into a cultural unconscious. Indeed, Gu argues that the conflicting accounts in China-West studies are the inevitable outcome of this cultural unconscious which constitutes the inner logic of a comprehensive knowledge system which he terms ‘Sinologism’. This book explores Sinologism’s origin, development, characteristics, and inner logic, and critiques its manifestations in the writings of Chinese, Western, and non-Western thinkers and scholars, including Montesquieu, Herder, Hegel, Marx, Weber, Russell, Pound, Wang Guowei, Guo Moruo, Gu Jiegang, Wen Yiduo, and many others in diverse disciplines from arts and humanities to social sciences. In doing so, Gu demonstrates why the existing critical models are inadequate for Chinese materials and makes an attempt to construct an alternative theory to Orientalism and postcolonialism for China-West studies and cross-cultural studies. Sinologism crosses over the subjects of history, thought, literature, language, art, archaeology, religion, aesthetics and cultural theory, and will appeal to students and scholars of East-West studies with a particular focus on China, as well as those interested in cultural theory more broadly. 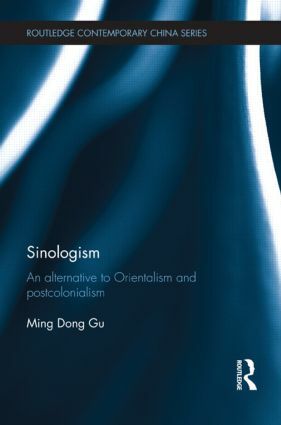 "I am pleased to write a preface for Professor Ming Dong Gu’s distinguished book, Sinologism: An alternative to Orientalism and Postcolonialism. It is an honor to have been asked to do this. Sinologism is an extremely important and timely book…Sinologism is, in scope, timely importance, and conceptual originality, Gu’s most distinguished book so far. It is the product of many years of research and thinking…I urge all who read this preface to hurry on to read the book itself. It is a wonderfully exciting work of scholarship and analysis. Sinologism is a major contribution to China-Western Studies and cross-cultural studies. It is a superbly learned and wide-ranging book. Its highly original theoretical paradigm is persuasively cogent. The book will be constructively useful as an alternative to Orientalism and postcolonialism." - from the preface by Prof. J. Hillis Miller. Ming Dong Gu is Professor of Comparative Literature at the University of Texas at Dallas, USA.